Golf courses have, for many years, been used as “dates” between the potential business partners. A friendly game of golf can go a long way towards making the proper impression and seal that deal that will bring prosperity for the company. However, going out on the course does not, in itself, mean that the deal will be struck. Instead, the course should be considered as a sort of proving grounds and a place where you should be on your best behavior, while paying attention to golfing etiquette and good manners. So, in order to increase the chances of tying up the business, here’s some advice on how to behave on the course. It might sound a bit frightening to go to a golf course with three totally unknown persons (that depends on how socially anxious you are), but this is the best way to get to the set goal. Going alone will put you in a situation where you will have 4-5 hours of golf to communicate with strangers and to get to know them well. This will appeal to their character and they will be more receptive to offers. Relax. You have got plenty of time to discuss business during the course of the game. Getting straight to the point might leave the potential partners under the impression that you are desperate. On the other hand, talking about other things will allow you to judge their character and become better acquainted with their situation, the information that can enable you to make vital changes to the offer that you were to present. Also, spending some time listening to their side of the story will give out the impression of being a real partner in business – meaning that they will trust you (and your company) more. The way you play golf will, in a lot of ways, be a signal as to how you behave in everyday life. I’ve already said that one’s behavior on the course is a good judgment of one’s character. With that in mind, it is quite logical that you should not employ any cheating tactics. Just imagine that you are playing golf against someone who you know is cheating. Would you trust them enough to cooperate with them? Would you refer them to anyone? I know I wouldn’t. Always bear in mind that a round of golf may last up to five hours. So, if you are thinking about making other arrangements for that day, it would be wise to delay or postpone them, in order not to jeopardize not making it to the course on time. If you have a warm-up routine that you follow before starting a game, be sure to arrive one hour before the start so that you would have the time to do everything that you usually do. According to the British, a bet is an agreement between two gentlemen. 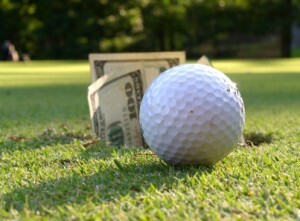 Now, a small friendly wager is an integral part of a game of golf. It increases competitiveness just enough to give you a sense of achievement should you win. However, do not go over the friendly limit and keep your bets between $2 and $10. Finally, according to the quotation above, be a gentleman and settle all the bets once the round is over. Even if you do not come to an agreement during the course of the game, a round of golf can be an invaluable promotion tool and a networking possibility. Making sure that your potential partners remember you after the game and keep in touch can also be quite a success. A friend of mine, Jake Rogers, who works at the Lost Golf Balls, has informed me that a lot of executives come and purchase golf balls by the dozens and have their company’s logo printed on them. They give these balls later to their potential business partners during the game. They will do a wondrous job as far as promotion is concerned. In a lot of ways, a business game of golf can be a ‘make-it-or-break-it’ situation for a business agreement. It is your job to make sure that everything goes according to plan and you alone are the person who can impress on the field. Also, take note that fun is the number one goal for any game of golf. So, bring your best manners and your most positive spirit with you. Ivan Dimitrijevic is a seasoned blogger and SEO consultant with years of experience. His set of skills includes Digital Marketing, Search Engine Optimization and blogging on a wide variety of topics. He has had many articles published on serious blogs over the years. His approach is direct, personal, professional and he will strive to use 100% of his knowledge and apply it to each and every project.